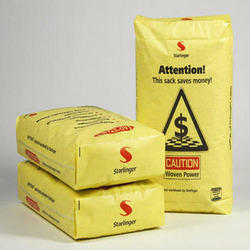 We offer Bottom Block cement bags, known as Ad*Star bags in different colors and sizes. 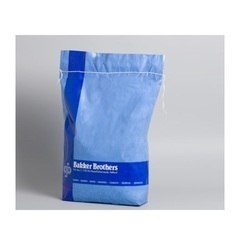 These cement bags are made out of high quality and can be used roughly. Many of our clients prefer our cement bags because of its cost effective nature. We offer our clients with two kinds of cement bags, namely, Bottom Block PP Cement bags and multi colored Block PP cement bags. These cement bags are explained below. We are the leading manufacturers and exporter of Ad Star Bag and our product is made of good quality. Knack Polymers provides Bottom Block Valve bag known as Ad*star Bags patented worldwide by Starlinger & Co. This bag is made without adhesives from coated polypropylene fabric. The sack can be produced either as a one-layer block bottom valve bag or as an open mouth bag with a block bottom having Flexo printing or with multicolor gravure printing. It surpasses all comparable products as far as resistance to breakage is concerned, is versatile and also eco-friendly and economical. Food Products: Flour, Sugar, Salt, -seed, Yeast, etc. Chemical industry: Fertilisers, herbicides, packaging of polyolefin pellets, hazardous materials, powders, etc. Agriculture: Cereals (Corn, Rice), seeds, feed, fodder, etc. We are the leading manufacturers and exporter of Multicolor Block Bottom Laminated Bag and our product is made of good quality. This bag is made without adhesives from coated polypropylene fabric with multicolor gravure printing. The sack can be produced either as a one-layer block bottom valve bag or as an open mouth bag with a block bottom having multi color gravure printing. Food Products: Flour, Sugar, Salt, Poppy-seed, Yeast, etc. We are the leading manufacturers and exporter of Block Bottom Bag and our product is made of good quality. Knack Polymers provides Block Bottom bag known as Ad*star Bags patented worldwide by Starlinger & Co. 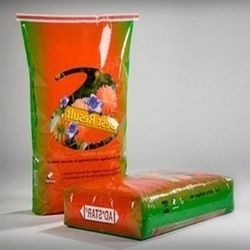 The sack can be produced either as a one-layer block bottom valve bag or as an open mouth bag with a block bottom having Flexo printing or with multi color gravure printing.